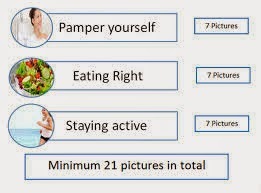 Most woman would love more times to themselves to indulge in pampering their skin and engaging in healthy activities to nurture their overall beauty and wellness. However, in a survey commission by DOVE among 108 women aged between 18-35 years, time and money are the BIGGEST hurdles in pampering oneself on a regular basic. 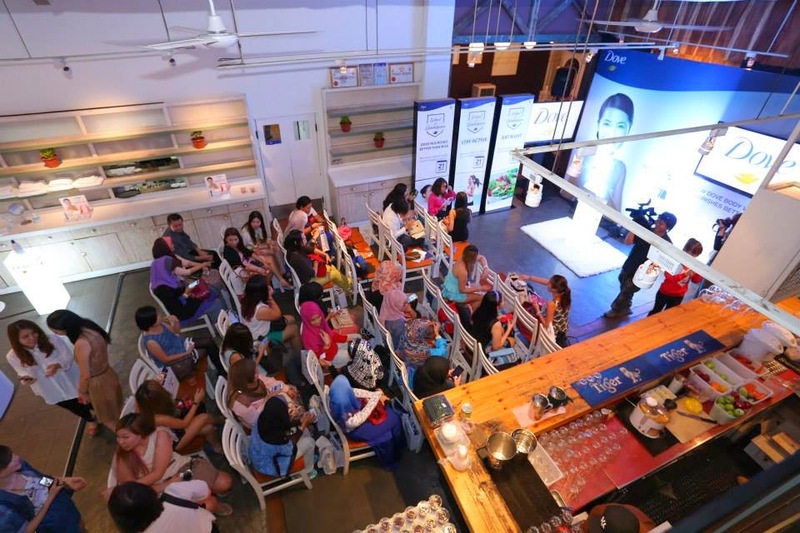 To encourage woman to indulge and pamper themselves on a daily basis in less time, with less money and all in the comfort of their own home, DOVE Body Wash with NutrimMoisture was launches the DOVE SKINDULGE campaign. The event was held at The Apartment, The Curve and I'm one of the 50 lovely butterflies from The Butterfly Project Malaysia were invited to the launch. 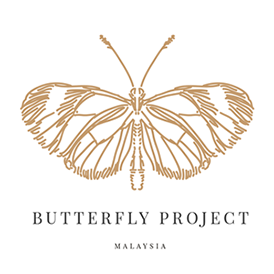 Thanks to The Butterfly Project Malaysia and Dove Body Wash! The new DOVE Body Wash, "your-better-than-milk-routine" is proven to to better than milk and all you need is just one or two pumps of DOVE with nutriumMoisture to deliver moisture and nourishing deeply to give your skin the pampering it needs. Showering with regular body washes natural moisture. 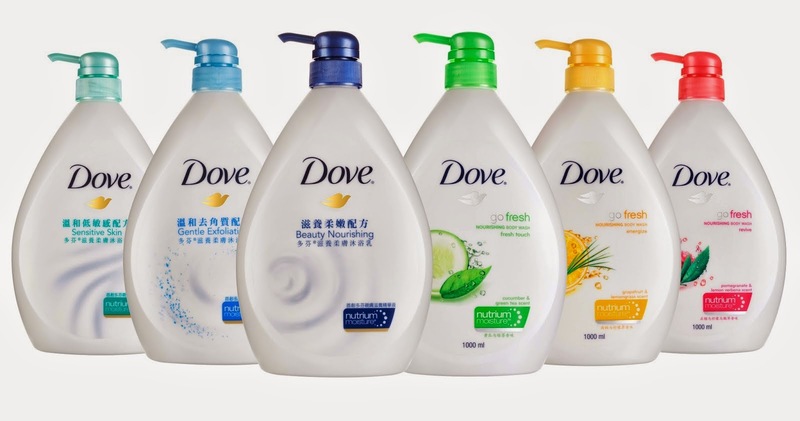 DOVE have to discover how to effectively nourish skin in the shower during cleansing. Instead of skin feeling dry and tight once you step out the shower, you are left with nourished and moisture skin, just as if you went for a spa treatment. NutriumMoisture technology is available in all variant - Beauty Nourishing, Gentle Exfoliating, Sensitive Skin, Fresh Touch, Energize and Revive in 1Liters bottle at RM22.90. It is also available in 200ml at RM5.90 for the Beauty Naurishing and Gentle Exfoliating Variant. The body washes are available at all leading pharmacies, hypermarkets and supermarkets. Those in group B, they were given the task to prepare 2 healthy dishes package with simple, quick , delicious and healthy food. They are learn how to make Broccoli chicken salad and soba salad. 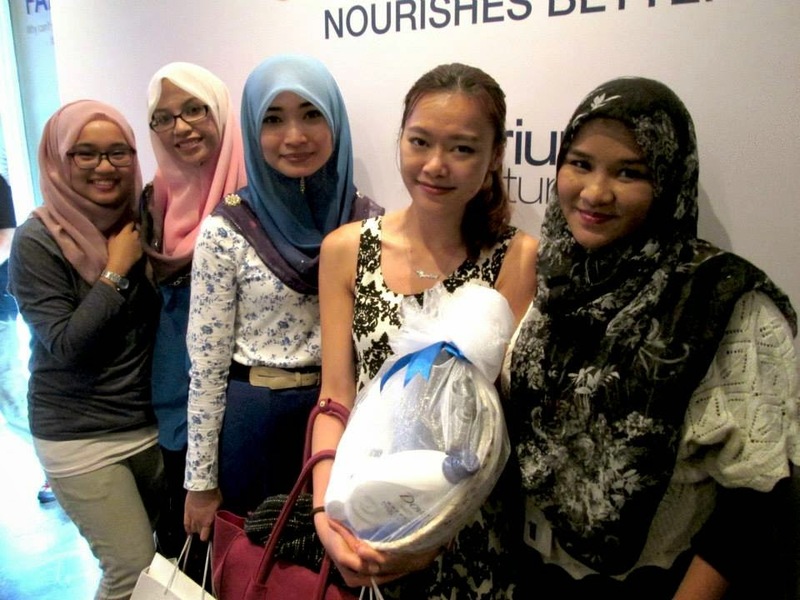 At this session, we learned about DOVE Body Wash with NutriumMoisture is proven to be better than milk. The unique blend of moisturizing and nourishing ingredients replenishes nutrient back into the skin while you shower. That in itself is daily pampering for your skin. Quick moisture test to compare Dove body wash and milk and DOVE body wash is seriously better than milk! Lets start pampering your body with DOVE body wash! Yes! I was in group C, During the session, we learning about how to stay active and had a simple exercise. 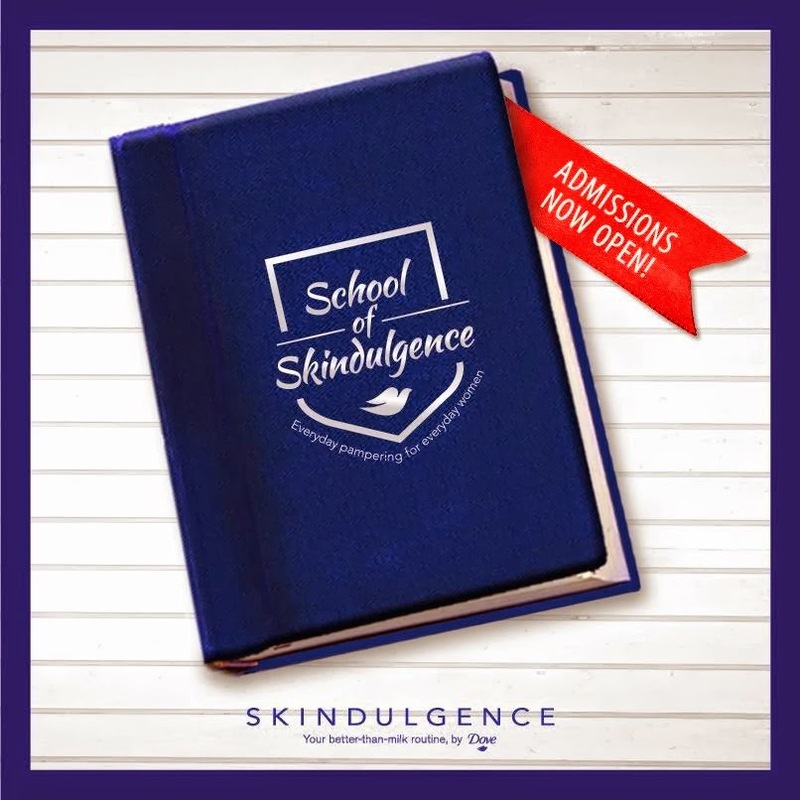 What is School of Skindulgence Campaign? The Survey confirms that woman tent to put themselves last and time and money are great barrier to achieving overall well being and pampering. 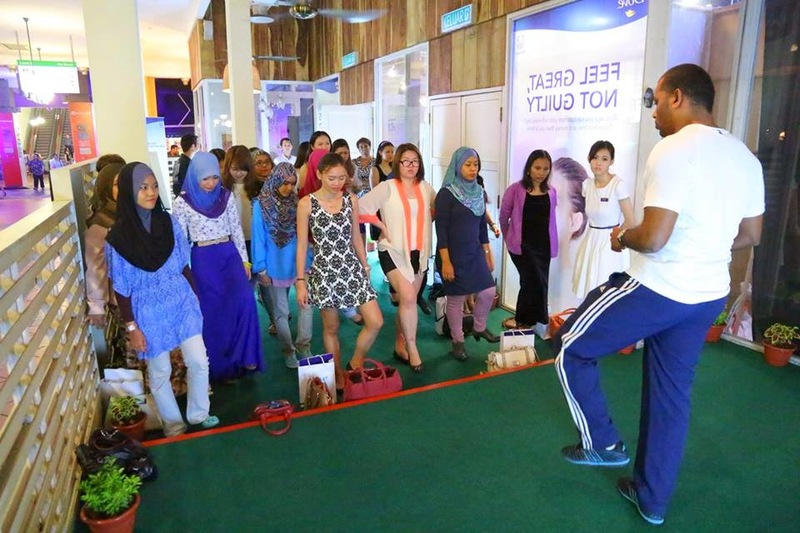 "DOVE would like to encourage woman to take a step further and pledge through the DOVE School of Skindulgence Facebook campaign to love themselves, eat right, stay active through simple no-hassle, no fuss, inexpensive activities that they can do at home for themselves, said Siti Suhaila Abd Hamid, Brand Manager, Unilever (M) Holding Sdn Bhd. 2. Contestants have to register using their Instagram account which will be linked to their Facebook page. 3. 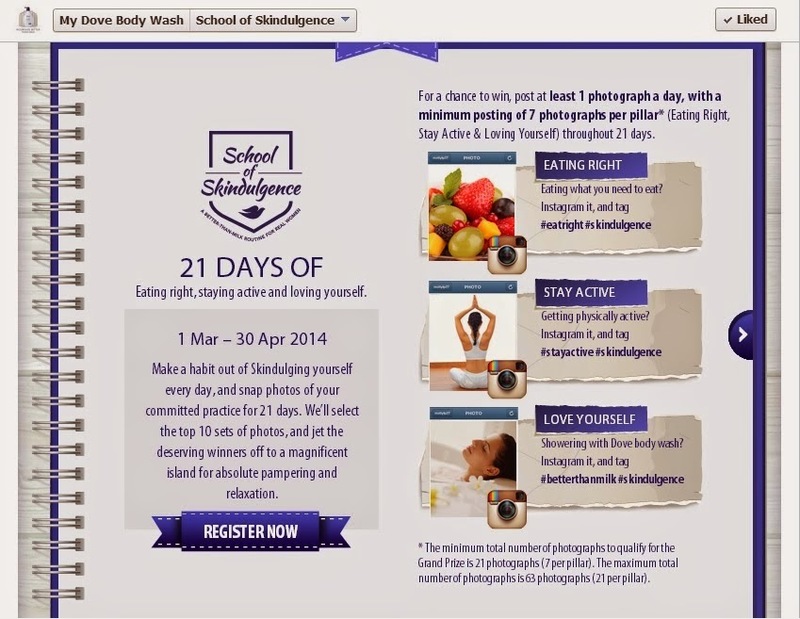 After taking the pledge on the Facebook app, contestants will over the period of 21 days, challenge themselves to achieve the 3 main pillar of SKINDULGENCE. 5. The more pictures you post, the better the chances of winning! 6. A continue posting for 21 days is compulsory. The challenge starts on 1 march 2014 and ends on 30 April 2014. The last day to pledge is on 10 April 2014. 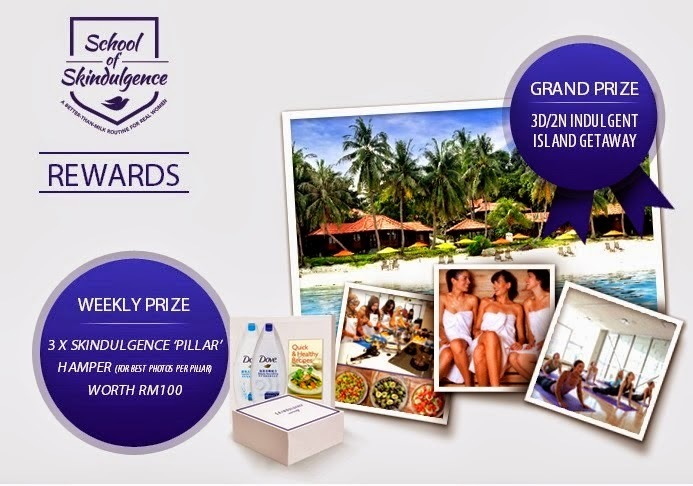 For seven weeks, 3 winners will be selected each week based on their creativity on each pillar and they will each win RM100 worth of DOVE Body wash hamper and and andddddd the 10 grand winners will have the memorable experience of a 3 day/2 night island gateway to Krabi. Till Then and good Luck!